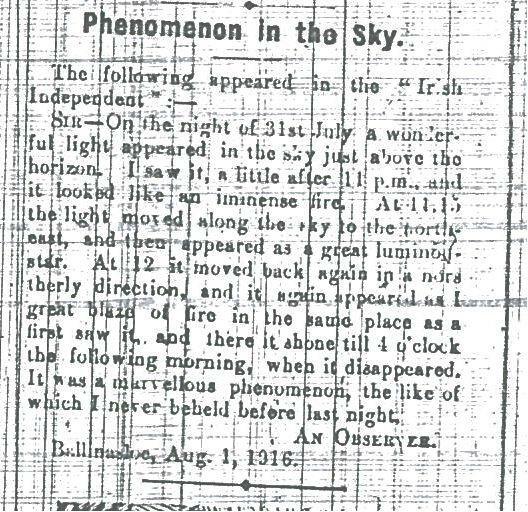 You are here: Home>Galway Commemorating>A UFO in Ballinasloe? 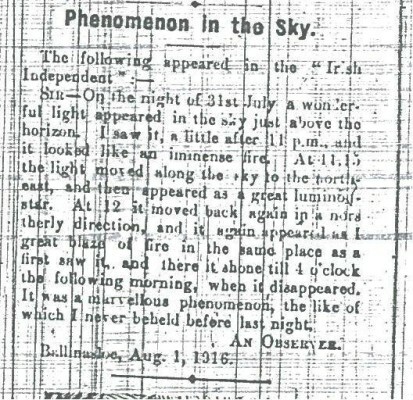 Sir – On the night of 31st July a wonderful light appeared in the sky just above the horizon. I saw it, a little after 11 p.m. and it looked like an immense fire. At 11.15 the light moved along the sky to the north-east, and then appeared as a great luminous star. At 12 it moved back back in a northerly direction, and it again appeared as a great blaze of fire in the same place as I first saw it, and there it shone till 4 o’clock the following morning, when it disappeared. It was a marvellous phenomenon, the like of which I never beheld before last night.